Am almost dynamic documentary about a dynamic couple. I was very excited to watch a documentry about the late, great Charles and Ray Eames. As someone who gets nerdy about design, I was looking forward to learning more about this powerful and creative couple. However Eames: The Architect and The Painter falls a little short. This documentary follows the lives and and careers of Ray and Charles Eames from their meeting at school through the end of their lives. And although this documentray covers all the aspects of their career, it doesn't really flesh out the main accomplishment they were largely known for, their furniture design. The filmmakers talk about the beginnings of the Eames chair and about mass production, but really don't explore it as much as I had hoped for. The film also teaches us that although Charles is most credited with the designs and accomplishments of the Eames name, Ray was much more involved than most people gave her credit for. The film does a good job at covering a lot of the things people may not know Ray and Charles Eames were behind, like helping ease Russian conflict with the United States. All of the things in the film are great to learn about, however the film has no conflict. The interview subjects, most of whom worked at the Eames office, just lightly brush over any topics that might be considered heated. For example, Charles was known to have numerous affairs outside of his marriage to Ray. In fact, Charles was married when he first met Ray, and his infidelity continued after the fact. But no one in the film really wants to talk about it. There was also great opportunity to really explore the conflict that Ray and Charles had in their collaborative relationship, but instead the film is more nostalgia than anything else. Eames is narrated by James Franco who does a good job with what he is given. There are also great design elements to the film that really add to its visual appeal. But both of those things were not enough to really hook me in. Overall, the film felt like an educational film that you would show to a classroom instead of a revealing documentary. I would love someone take another shot at this fascinating couple. There seems to be so much more to them than this documentary allows its audience. The Eames motto was, "The best for the most for the least." In my oprion, this film was, "The nostalgia for the many for the 84 minutes." 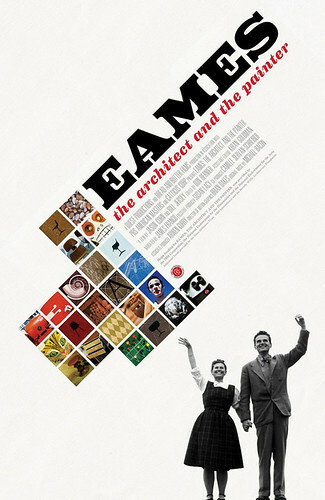 Eames: The Architect and The Painter opens in Los Angeles on November 18 at Laemmle's Music Hall.